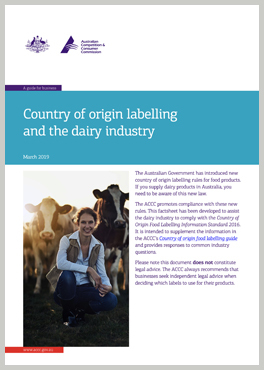 This factsheet has been developed to assist the dairy industry to comply with the Country of Origin Food Labelling Information Standard 2016. It is intended to supplement the information in the ACCC’s Country of origin food labelling guide and provides responses to common industry questions. Please note this document does not constitute legal advice. The ACCC always recommends that businesses seek independent legal advice when deciding which labels to use for their products.